There is a fascinating global phenomenon that brings people together on a Friday morning and provides them with coffee, stories and inspiration. It’s called Creative Mornings. 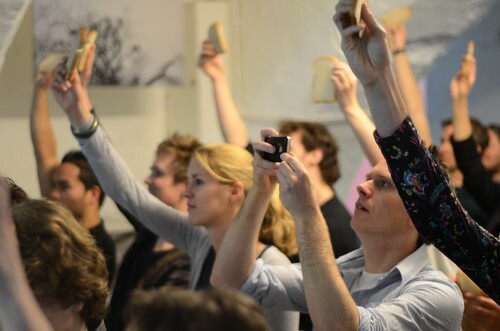 Recently, an edition of Creative Mornings sprung to life in Utrecht (@Utrecht_CM), our home town. After the first event we were convinced that we needed to step up and sponsor this local team. I’d like to take a minute and(*) elaborate why. First of all local events are great fun. They bring communities together. Events spark conversations. Conversations connect people and ideas. That’s what inspires us. That’s what we love to do and will support in every way we can. From my period as chairman of Mobile Monday Amsterdam, I know first hand what it feels like when you reach out for help and people show their support. It’s about people having faith in you and believe in what you do. Trust me, if you weren’t already excited about your venture, this kind of support will put you on an overdrive and pushes you to achieve things you couldn’t imagine. We believe that events like Creative Mornings are crucial for a healthy creative ecosystem. For us, Creative Mornings is a accessible platform that drives the discussion on the role of creativity in society and business. Discussions that help to build common ground among people but also challenge assumptions. Supporting this ecosystem is a long term strategy for us. To finish up, I’d strongly encourage you to actively support the people in your community who are doing something for the greater good. There’s no better morale booster than showing your support before it’s needed. If you’re looking for a business reason to do so, this is probably the best one; It just feels good to help out.